In recognition of his exceptional contributions to the education and training of others in Middle East studies. With deep appreciation for the extraordinary range of his intellectual and creative interests and his ability to instill in his students discipline, rigorous methods and academic confidence through patient critiques renowned for their comprehensiveness and the quantities of red ink used to convey them, For inspiring a love of the Arabic language, it’s literary heritage and it’s lore through such stirring teaching that students from as long as half a century ago recall his classes as if they attended them just yesterday. 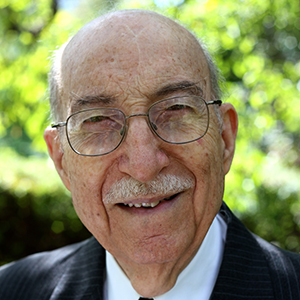 It is an honor to recognize Issa J. Boullata, an outstanding mentor who has introduced so many to the joys of scholarship and who has, through his generous sharing of knowledge, encouraged the careers of generations of students and colleagues.